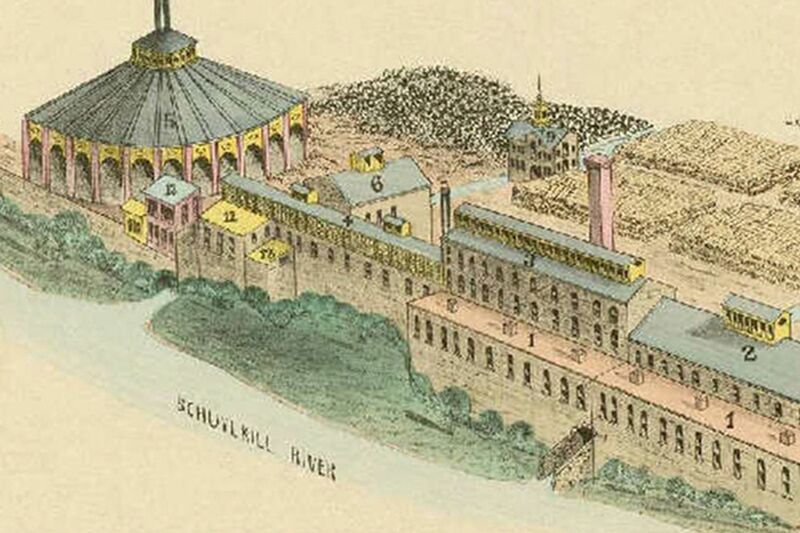 A drawing of what the PaperWorks mill in Manayunk looked like in the past. In the 1860s, it claimed it was the largest paper-making plant in the world. Just last month, PaperWorks Industries Inc. shuttered operations at its PaperWorks Philadelphia Mill in Manayunk, laying off 147 employees and bringing to an end nearly two centuries of paper-making at a plant once considered the largest in the world. Only a few weeks later, the Bala Cynwyd company is pinning its hopes on new life for the 31-acre property — to the tune of nearly $15 million. After a quiet 30-day period of shopping it to developers and investors, PaperWorks recently put the property — located on Manayunk's Venice Island — up for sale to the broader market, listing it at the multimillion-dollar price. According to marketing materials prepared by SVN International Corp., a commercial real estate advisement group that has been working through its local SVN Concordis Group to market and list the property, PaperWorks is seeking a buyer who can transform the industrial tract into what SVN is calling the "Venice Island Innovation Village," envisioned as a residential and commercial hub that could include some combination of apartments, offices, a hotel, or even a co-working space. There is a "major opportunity to create a new 'community place' that appeals to multiple market segments in the Philadelphia region," according to the marketing materials. "… Future possibilities include residential, entrepreneurial hub, office, hotel & hospitality, sports & recreation, health care & wellness, educational, park, and riverwalk." Offers will be taken until July 31. Earlier this year, officials alluded to possible redevelopment of the site, with Jane Lipton, executive director of the Manayunk Development Corp., telling the Inquirer that her vision during her tenure is "to see all of [Venice Island] developed" as part of a second rebirth that Manayunk is hoping to enjoy. Development would be quite a change for this stretch of Venice Island, which is zoned as I-2 "medium" Industrial. According to PaperWorks' website, the mill served as the largest paper-making plant in the 1860s, and until it was shuttered "offered the widest paper machine in the world." About 10 groups have toured the property with interest, and many are keen on incorporating some kind of mixed-use, entrepreneurial concept, said David Wilk, national cochair for corporate real estate services at SVN. "It's a really unique property … and it has the opportunity to be this tremendous new economic-development hub," Wilk said in an interview Tuesday. "Our hope is that we really have a great collaboration with the community … to help us reimagine the property in the future." There is "lots of opportunity to not only benefit from the residential use, but other entrepreneurial uses and lifestyle uses," he said. Situated near the Ivy Ridge SEPTA station, the tract is set between the Schuylkill River and the Schuylkill Canal, and, for now, is home to multiple vacant lots and the 550,000-square-foot paper mill — which for years produced coated-recycled paperboard for folding carton packaging. The entry point to the tract is along East Flat Rock Road from Manayunk's Main Street, a road notorious for heavy traffic during rush hour. As part of the redevelopment plans, Wilk said, SVN has been meeting with city and neighborhood officials to discuss ways to improve infrastructure at the site. Recently, residential developers have been increasingly attracted to Venice Island, despite local protests about new developments and complaints that the area has been prone to flooding. Still, that was not enough to stop new projects such as the Isle, an apartment complex by Realen Properties that opened along Venice Island in December. Over the years, the Manayunk paper mill has undergone a series of ownership changes, most recently in 2008. At the time, Sun Capital Partners Inc., a private investment firm, purchased the Manayunk mill and another in Wabash, Ind., from Graphic Packaging Holding Co. Sun Capital Partners created the company PaperWorks from the purchase. Property records show the site was last purchased in 2008 for $14.3 million.